Gabriele Piozzi (Quinzano d’Oglio, 1740 Tremeirchion, 1809) by George Dance, pencil, 1793 Born near Brescia, Gabriele Piozzi lived for several years England and Wales, working as tenor singer, teacher and pianist. 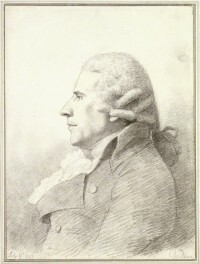 Piozzi arrived in England in 1776, and during his stay in the British isles, he published six collections of works for keyboard, strings and voices. His public career was relatively short, but he had strong connections with the cultural elite of the time, namely with Charles Burney and Samuel Johnson, at least until 1784. In that year he decided to marry Mrs Thrale, a noble lady of literary accomplishments who was before married to a rich brewer: the wedding was strongly condemned by both Johnson and Burney, former Mrs Thrale’s friends, because of Piozzi’s occupation, for his Italian origins and probably also because of his catholic religion. The marriage was also contrasted by Mrs Thrale’s daughters, who saw in the Italian a danger for the family’s wealth. On the contrary, Piozzi by that time had already amassed a substantial fortune in England, and with this advantageous marriage he was able to discontinue his career as a professional musician, though he occasionally performed in private concerts. At the same time, he carefully administered his wife’s estate. Nevertheless, the couple lived together and travelled to Italy from 1784 to 1787 and lately, after a period in London, Mr and Mrs Piozzi retired to their new villa, called Brynbella, in North Wales. Piozzi relished his life as a country gentleman, but his last years were marred by severe attacks of gout. Both Piozzi and later his wife were buried beneath the medieval church at Tremerchion. Piozzi’s compositions are still unpublished nowadays, and yet they deserve a place in the musical production of late eighteenth-century Britain. They look even more peculiar considering that Piozzi, along with the castrato Venanzio Rauzzini (1746-1810), was a rare case of singer/composer. Thanks to a grantawarded to Simone Laghi by the Worshipful Livery Company of Wales, Ensemble Symposium undertook in 2015 a project of edition and re-evaluation of Piozzi’s string quartets. This set of six string quartets, published by the author as Op. 4, were dedicated to the Count of Maltzan, Prussian ambassador in London. All the quartets are in three movements in the form fast-slow-fast, and were probably destined for domestic concerts and private entertainment in the aristocratic salons. A premiere of Piozzi’s String Quartet Op. 4 n. 1 will be performed by Ensemble Symposium on 27 October at the Cardiff School of Music Concert Hall, in Corbett Road (Cardiff).